Optima batteries are expensive. A lot of us run them in weekend rigs or something that only gets used seasonally - the last thing we want is to need to buy a new one from running it down or not keeping it charged. Luckily, although Optimas use different tech from regular batteries, they aren't hard to charge and maintain. We'll take a look at some different Optima chargers, how to charge an Optima battery, trickle charging Optimas, and a trick for recharging a deeply discharged Optima. Do You Need a Special Charger For an Optima Battery? The short answer is that a normal battery charger will work for an Optima in "normal" conditions. This would be doing things like float charging or topping up a lightly discharged battery. But if you need to resuscitate a dead Optima that has been deeply discharged, you need a special charger (there is a trick around this). Why Would You Need an Optima-Specific Charger? Optima batteries have a low internal resistance and this fact drives a lot of their performance. Traditional batteries have high internal resistance. Basically, it's easier to get more electricity out of an Optima than a traditional battery. Where a traditional battery might just putter out, an Optima can keep running down and providing amps to whatever you're doing. The problem appears when you have a deeply discharged Optima and a traditional battery charger. Traditional analog battery chargers are pretty dumb. They primarily work by reading battery voltage and using that to determine whether to charge a battery or not. To a traditional battery charger, a deeply discharged Optima battery is a bad battery. For the most part, "deeply discharged" means an Optima that reads at 10.5 volts or less on a voltmeter. In fact, if a battery reaches 10.5 volts, it's considered to be "fully discharged". With a traditional battery, a 10.5V reading means it's not putting out any more power. But a 10.5V-reading, low-resistance Optima will still pump some electricity out until it reaches a pretty low voltage. A traditional battery charger that sees 10.5V or less on an Optima won't even turn on. However, an Optima battery charger can recharge an Optima that has a voltage as low as 1.25 volts! 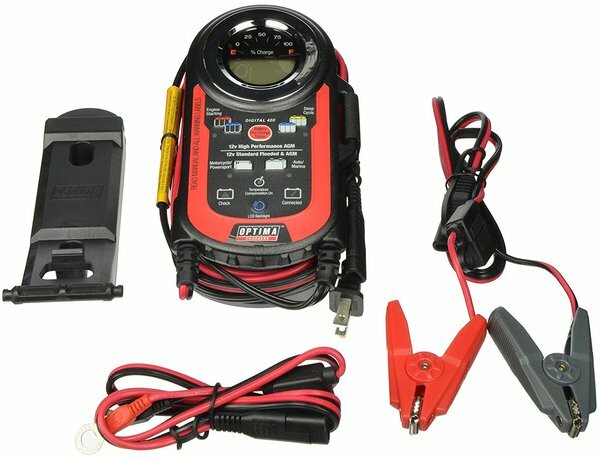 What Output Does an Optima Battery Need From a Charger? Optima recommends a maximum of 10 amps at 13.8-15 volts for regular charging. If you're float charging, Optima recommends a maximum of 1 amp at 13.2-13.8 volts. What Kind of Features Should I Look for in a Charger? You KNOW that Optima-brand battery chargers work with their batteries, but they work with other battery types as well. Most of us aren't just running Optimas - we've got lawnmower batteries, motorcycle batteries, standard car batteries, and more that aren't necessarily AGM. If you want to charge different types of batteries and you want one charger to do it all, make sure the charger you pick has modes. Most traditional analog chargers aren't able to recover a battery discharged below 10.5 volts. Since Optima RedTops, YellowTops, and BlueTops can all be discharged below 10.5V without being wrecked like a traditional battery, they can still be recoverable but not with an old-style charger. You should not be deeply discharging Optima RedTops or dark-case BlueTops. These are starting batteries and are meant to exist at nearly full capacity during their lifetime. If you need to draw a battery down, you need a deep cycle battery, like an Optima YellowTop or light-case BlueTop. Read more about how to pick the right Optima here. Lots of us have rigs that only come out in Spring, Summer, and Fall. Sometimes, you've got a project sitting in a corner for weeks at a time. This kind of inactivity can kill your battery unless you keep it charged. How do you keep the battery fresh? With a float or trickle charger. Instead of dumping a relatively high amperage into the battery, a float charger will put out a lower amperage, around an amp, along with a slightly lower voltage, to maintain your battery. Many digital chargers now come with float functions that will keep a low amp current flowing to your Optima on an as-needed basis to keep it topped-up and healthy. If you have any kind of battery that sits for weeks at a time without being used, you should put it on a trickle charger to prolong its life! We talk more about those below, but we at least like to see the features that can be digitally controlled because it's easy for the manufacturer to add them in. The higher the amp output of the charger, the faster a battery will charge. Batteries have a certain capacity that is measured in amp-hours. A typical Optima auto battery has around 50 amp-hours of capacity at a C20 rating. This means the battery can provide 2.5 amps per hour over 20 hours, at which point it will have reached 10.5V. That 2.5A comes from dividing the amp-hours (50 amp-hours) by 20 hours (from the C20 rating). But really, we're more interested in how a charger's amp output affects our charge rate, and how long it takes. Note that this is an approximate formula and works for batteries that are "fully" discharged to 10.5 volts. A battery at 11.5 volts, for instance, will charge faster. How Long Does it Take to Recharge a Fully Discharged Optima? This depends on how how deeply discharged the battery is, its amp-hour rating, and the charge rate (in amps) of the charger. The formula will work for other batteries, as well. It doesn't matter if it is AGM, gel, traditional lead-acid, deep cycle, or starting. The same formula will generally apply. This charger works for Optima batteries, as well as non-AGM batteries. The Optima 400 Charger is Optima's smaller battery charger. This charger is good if you mostly want to maintain an Optima and occasionally need to charge a deeply discharged battery. This charger will do everything you want, but at a slower rate than a larger charger. While this charger will charge any AGM or lead-acid battery just fine, it has a slightly low output at 4 amps max, which means it'll take longer to bet your battery fully charged. It'll adjust the charge rate depending on the temperature. This is important because extreme heat and cold both have a big effect on your battery. It has spark-free battery connection. This has been a particular problem in the past with batteries that off-gas hydrogen. Hydrogen ignites easily which means that historically, we've always had to be careful about hooking up a battery in case a spark might ignite the hydrogen. The charger also has reverse polarity protection. We've never had a problem with hooking up the 12V leads the wrong way, but could imagine that this would screw up the electronics in the charger. Anyway - if you hook up the leads incorrectly, the charger won't work. The 400 will charge small batteries (like a lawnmower or motorcycle battery) at 3 amps and large batteries at 4 amps. Stage 1: Analyze your battery for the state of charge and quality of connections before charging. Stage 2: Soft ramp charging-controlled amperage for deeply discharged batteries - when necessary. Stage 3: Fast charge bulk mode for batteries moderately discharged - also known asnormal battery usage. Stage 4: Conditioning mode for conditioning your battery with a finish/complete charge. Stage 5: Auto maintain, float mode for keeping your battery fully charged. Stage 6: A 30-day storage recondition mode - while your vehicle or battery is in storage and is being maintained. It includes a 6' long AC for hooking up to a 100-120VAC receptacle and a 6' DC cable for hooking up to your battery. The 1200 can charge any battery quickly, with a high 12A charge output - the highest of the chargers we looked at. It's the most fully featured charger of the bunch. 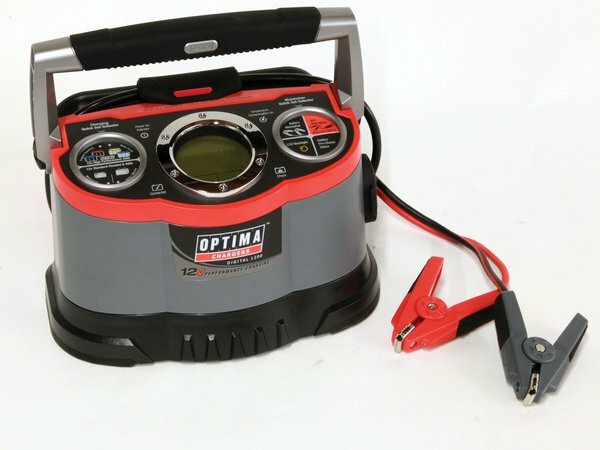 The Optima 1200 Charger is Optima's big battery charger. This charger is perfect for regular charging, charging deeply discharged batteries, and float charging batteries that will be "resting" for a few weeks or more. It has a much higher output than the Optima 400 charger at 12 amps (versus the 400's 4 amps) so it'll charge much faster. If you have a more serious shop with lots of projects, we think this is a better charger than the 400. It's more likely that you'll be using it more and can use the extra juice. One feature that initially seemed pretty dorky is the in-clamp LED light. This is obviously super-handy when you're can't see working in the dark and can't see which post you're hooking up to. Not essential, but a nice touch. We don't really care about the included USB port - we have enough of those. It'll adjust the charge rate based on temperature to keep your Optima in good shape. It has spark-free connections to keep you from exploding in your garage if you have an off-gassing battery. It has reverse-polarity protection so you can't hook up the leads incorrectly. It has everything else, so why not this, too? The 1200 will charge large or small batteries without a problem. Like the 400 it'll do starting, deep cycle, AGM, or standard flooded batteries. It's the one charger to rule them all. 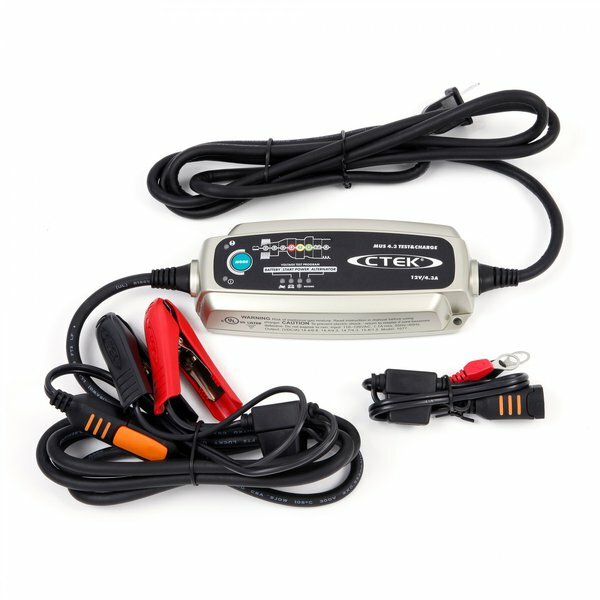 This budget charger from CTEK has a slightly low charge rate, but is great for charging and maintaining RedTops. 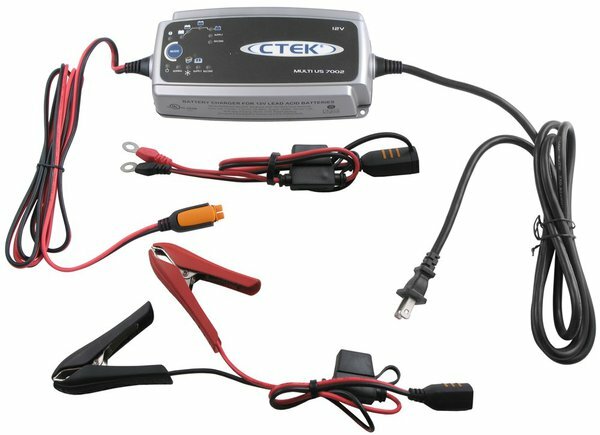 There are several CTEK chargers available, but we picked out 3 of the most popular and highest rated. The 3300 is a small and simple charger, putting out 3.3 amps. It's the least sophisticated charger on this page and also has the lowest output. If you've got one vehicle battery that you need to charge and maintain, this charger is a great choice. The 3300 is IP65 waterproof, which means it's splash and dust-proof. 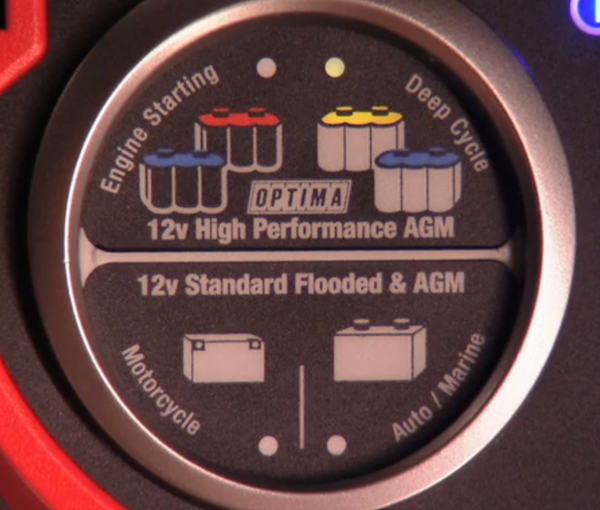 The Optima chargers have a setting for deep cycle batteries. However, the 3300 is only specified to work with Optima RedTops (it'll also work with dark-case BlueTops). Once your battery is charged, the charger switches to a maintenance mode. It includes ring terminals that you can permanently hook up to your Optima if you want to be able to use it as a float charger. It won't charge if you swap the 12v leads (reverse-polarity protection) and has spark-free connections. This is great especially for non-sealed batteries that are more prone to off-gassing explosive hydrogen. The CTEK 3300 will also automatically desulphate your batteries if it detects sulfation. 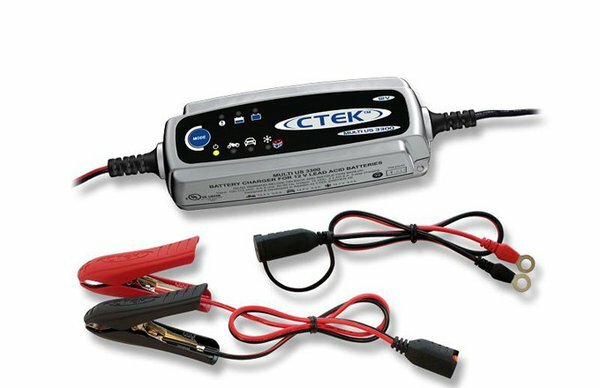 This mid-range charger from CTEK will charge desulfate, and trickle charge ALL Optima batteries. It has a 4.3A charge output. The MU 4.3 Test and Charge is different from the 3300 by having a slightly higher charge current at 4.3 amps, plus it does some diagnostics on your charging system to inform you of it's performance. While CTEK specifies that you can use the 3300 for RedTops, the MUS 4.3 is fine for any Optima. It's also IP65 waterproof, which means it's splash and dust-proof. Rain is okay, submersion is not. The MU 4.3 specifically has a mode for Optimas and a picture of an Optima on the mode selection. While it charges normal flooded batteries at 14.4 volts, it'll charge Optimas at a higher 14.7 volts - just what they need. The charger is fully automatic and will switch to a float mode once your Optima is charged up. It charges at a max of 4.3 amps. Step 1 - Desulfation: Detects sulfated batteries. Pulsing current and voltage, removes sulfate from the lead plates of the battery restoring the battery capacity. Step 2 - Soft Start: Tests if the battery can accept charge. This step prevents that charging proceeds with a defect battery. Step 3 - Bulk: Charging with maximum current until approximately 80% battery capacity. Step 4 - Absorption: Charging with declining current to maximize up to 100% battery capacity. Step 5 - Analyze: Tests if the battery can hold charge. Batteries that can not hold charge may need to be replaced. Step 6 - Recond: Choose the Recond program to add the Recond step to the charging process. During the Recond step voltage increases to create controlled gassing in the battery. Gassing mixes the battery acid and gives back energy to the battery. Step 7 - Float: Maintaining the battery voltage at maximum level by providing a constant voltage charge. Step 8 - Pulse: Maintaining the battery at 95–100% capacity. The charger monitors the battery voltage and gives a pulse when necessary to keep the battery fully charged. One feature we really like about this charger is "Supply Mode" - it allows you to keep 13.8V at the terminals when you're swapping a battery. This can save settings and ensure that you don't trigger theft and safety features that prevent starting after a battery change. The main ways the 7002 is different from the other CTEK chargers is that it has a 7 amp max charge current and a Supply Mode. "Supply Mode" is pretty cool. In this mode the charger acts as a 13.8 volt power supply. It supplies up to 7 amps. There are a few ways we could use this, but the biggest one is swapping a battery without losing settings or needing to unlock the computer after the battery has been disconnected (a friend actually had to call a dealer because he disconnected the battery on a rig that was on display indoors - crazy!). With an IP rating of IP65, the charger is dust and rainproof. While it can be rained on, you should never let it be submerged. The 7002 works great with Optimas - CTEK even says it's perfect for the YellowTop (but it'll work great for a RedTop or YellowTop, as well). Make sure you follow these directions carefully! Working with batteries is dangerous. You don't want a battery exploding on you. The problem with traditional analog chargers is that they won't start charging if the battery to be charged reads at 10.5 volts or less. Hook the dead Optima to the second battery with the jumper cables. Go positive to positive and negative to negative, just like you're doing a jump. Hook the battery charger up to the "good" battery (not the dead Optima) and turn it on. It'll try to charge the "good" battery, and in doing so will also charge the deeply discharged Optima. Leave it for an hour and come back. When you come back, disconnect the whole setup and check the voltage on the Optima. If the Optima's voltage is 10.5 volts or higher, you can start charging with the charger as though the Optima is a regular battery. If not, repeat steps 1 and 2 and charge for another hour. Instead of waiting a full hour to check it, check it every 15 minutes or so until it hits 10.5 volts. Monitor the battery during this entire process! If it gets hot to the touch (warm is okay), shut it down! If the Optima starts off-gassing through the vent holes, shut it down! If either of the above happen, your Optima is probably bad. Which Optima Battery Is The Best For You? Roundforge.com is a participant in the Amazon Services LLC Associates Program, an affiliate advertising program designed to provide a means for sites to earn advertising fees by advertising and linking to Amazon.com. Amazon, the Amazon logo, AmazonSupply, and the AmazonSupply logo are trademarks of Amazon.com, Inc. or its affiliates. We also participate in other affiliate programs.